As was announced late last year, the Indian space agency isn’t going to send astronauts into orbit on its own anytime soon. However, ISRO will send an orbiter to Mars next year, which would be the nation’s first interplanetary probe and only the second time it has sent a spacecraft beyond Earth orbit. Meanwhile, the Chandrayaan-II mission continues to slip into the future as ISRO gears up for several advanced rocket tests. ISRO’s new 67.2 billion rupee ($1.3 billion) budget includes 145 crore rupees ($28.3 million) for its nascent human spaceflight program. Major priorities under the program include crew module system, human-rating the launch vehicle, aerodynamic characterization work, mission studies, and study contracts for national and international institutions, according to a government statement. A key project is the Space Capsule Recovery Experiment (SRE), which is designed to develop the capability to return an orbiting capsule to Earth. ISRO successfully launched and recovered the SRE-I mission in January 2007. The follow-on SRE-II is now being planned to further demonstrate re-entry technologies. Not long ago, officials had talked about launching crews into orbit by the middle of this decade. However, that date gradually slipped. At the end of December, an official that the selection of Indian astronauts wouldn’t even begin until 2020, a clear signal that human flights had slipped significantly. ISRO has never publicly addressed the reasons for the delay. The new ISRO budget contains $24.4 million for a Mars orbiter, which will be launched in November 2013 aboard a Polar Satellite Launch Vehicle (PSLV). The spacecraft will be placed in a 500 x 80,000 km (311 x 497,000 mile) orbit around the Red Planet and carry “nearly 25 kg” (55 lbs.) of scientific payloads, according to government budget documents. Budget documents indicate that the launch of the Chandrayaan-II lunar mission, which will include an orbiter and a lander, has slipped into the 2014-2015 period. The spacecraft had been originally scheduled for launch in 2012. A key problem for India’s space ambitions is the poor state of its rocket technology. Although the solid-fuel PSLV is very reliable, the larger liquid-fuel Geosynchronous Satellite Launch Vehicle (GSLV) has a poor history of success over the years, with two successes, four failures and one partial success. ISRO also has failed to master cryogenic liquid oxygen-liquid hydrogen upper stage technology required to launch communications satellites to geosynchronous orbit and large spacecraft to the moon and Mars. 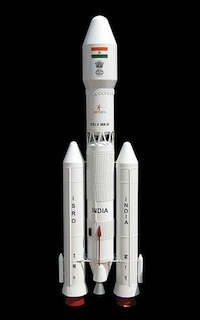 Model of India's GSLV Mark III rocket. ISRO is planning to launch the GSLV again this year with the GSAT-6 satellite aboard. The flight will feature an improved version of Indian-developed cryogenic upper stage that failed in its first launch attempt in April 2010. Officials had originally planned to fly the upper stage a year after that accident, but the schedule has slipped for unknown reasons. A specific launch date has not been announced. This will mark the first GSLV flight since Christmas Day 2010 when a launch attempt failed, sending the rocket and its payload into the Bay of Bengal. The GSLV is capable of delivering satellites weighing 2 metric tons (2.2 tons) into geosynchronous transfer orbit (GTO). ISRO is continuing development of work the larger GSLV Mark III rocket, which will be capable of delivering 4 metric ton (4.4 ton) communications satellites to GTO and 10 metric tons (11 tons) to LEO. The Mark III will be required for human missions. The rocket, which is set to begin flight testing later this year, will feature a 200-metric ton (220 ton) solid stage booster, 25-metric ton (27.5 ton) cryogenic engines, and 110-metric ton (121-ton) liquid stage engines as core boosters. A launch date has not been announced. The GSLV Mark III is designed to carry India’s Advanced Communication Satellite (GSAT-11), whose configuration is now being finalized. The rocket and its cryogenic upper stage will also allow India to compete in the international market for launching geosynchronous satellites. The ISRO budget also contains funding for the development of a high-thrust semi-cryogenic engine and stage that would use kerosene and liquid oxygen for use on advanced launch vehicles.